DevExpress.ExpressApp.Model.Core.DuplicateModelNodeIdException: There is already node with Id ‘NumeratorValue_ListView’. The node: Application/Views/NumeratorValue_ListView. Unfortunately the provided information is insufficient to find a cause of this issue. and would you send us the file eXpressAppFramework.log? Web path for the file eXpressAppFramework.log: ProjectName.Web. Win path for the file eXpressAppFramework.log: ProjectName.Win\bin\Debug or Release. Yes, I was using the Numerator class. When I removed it the error went away. Attached is the Log. Please, try this solution and feel free to contact us if you need further assistance or have additional questions. So if I am using XPO Domain Components I would just need the XafariBCNumeratorsDCModule? 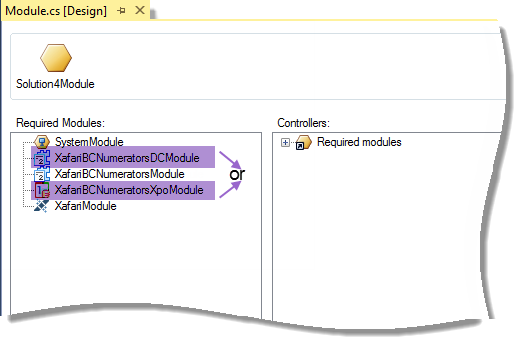 Yes, you would use XafariBCNumeratorsDCModule for XPO Domain Components.